Just like those famous peanut butter cups! 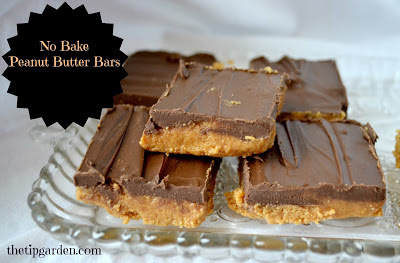 These no bake peanut butter bars take only a few ingredients and a few minutes to make! I can not begin to tell you how much you need to give this recipe a try! I first found this recipe over at Sallysbakingaddiction, and immediately realized that I had all the ingredients on hand and stopped doing laundry to make them. (that was a no brainer!) less than 10 minutes to get these in the fridge in the afternoon and they had a few hours to set up in time for an evening dessert. They were everything you'd imagine. 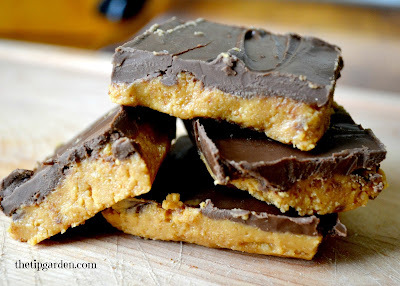 Peanut buttery, chocolaty, Heaven! These will be in my holiday baking list FOR SURE! ok, lets' get you started! Line a 8x8 or 9x9 pan with aluminum foil, making sure to cover the bottom & up the sides. Set aside till later. In a mixing bowl, mix together the melted butter, cracker crumbs & the powdered sugar till combined. Stir the peanut butter into the cracker mixture. Spread peanut butter/cracker mixture evenly into the prepared pan. In a microwave safe bowl, place the chocolate chips along with the 2 Tablespoons of Peanut butter. Melt chocolate chips for 30 seconds. Remove from microwave and stir. If not completely melted microwave for 15 more seconds and check again. Spread chocolate evenly over the peanut butter layer. Chill the pan in the refrigerator approx 2-3 hours till completely set/firm.